Also we are setting up a blood drive and need volunteers to help with designing flyers, hanging flyers, helping the day of the blood drive by checking people in, etc.... again we can not do this alone. It doesn't have to be members either your significant others, young adult family members are welcome to help as well. We are all family and this is a chance to not only help others but be part of our community. Good morning members! Happy Hump Day, I hope you are all enjoying this beautiful weather. I just wanted to let everyone know that we are working on putting together the "SOC" (sending out care) committee and are looking for everyone who is willing to participate. We can not impact those around us without coming together. If you are interested and willing to be involved please contact me at the office 207-621-0555 or email me rcass@uanet.org or message me on here. We need help with everything... people willing to do outside yard work, taking meals to members who can't do them right now because of illness/injury, minor repairs to homes, we have no idea what they might need so if you have time and a talent or two or three please consider joining our SOC committee. Thank you. Register for Maine Labor Lobby Day: Thursday, March 14! When it comes to making laws that affect working people, too often paid corporate lobbyists are in the driver’s seat. That’s why we hold our annual Labor Lobby Day for workers to come to Augusta to talk with their local legislators about bills that impact the working class. This year, Labor Lobby Day will be held at the State House on Thursday, March 14th at 7:45 a.m. This is a great opportunity for union members to learn new skills, talk with their legislators about important bills and connect with members of the labor movement. Click here to register! Call Sarah at 207-622-9675 or email sarah@maineaflcio.org for more information. Check out our photos from Lobby Day 2018! 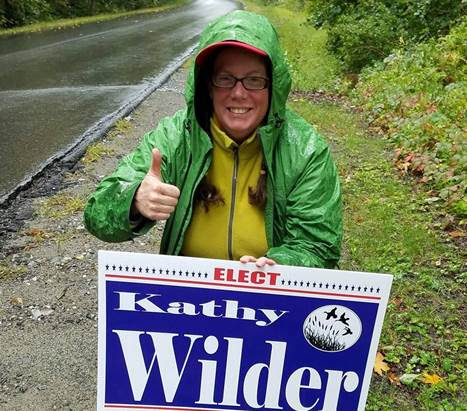 United Steel Workers Local 9 member Kathy Wilder, who works as a chemical prep operator at Sappi Fine Paper in Skowhegan, won a write-in election for school board in MSAD 54 Monday night. Kathy says that her priorities will be student achievement, fiscal responsibility, clear communications and social justice. Kathy worked with the Maine AFL-CIO in 2018 as part of our Labor Candidate training program to elect more union members and working class people to elected office at all levels. She ran for the Maine State Legislature in 2018. Congrats on your new position, Kathy! Congressman Jared Golden will discuss the Trump administration’s proposed revision of the NAFTA trade agreement at the annual Maine Fair Trade Campaign dinner at the Plumbers & Pipefitters Hall at 21 Gabriel Drive in Augusta at 6 pm on March 30. Congresswoman Chellie Pingree has also been invited to attend, but has not yet confirmed. Social hour begins at 5:30 pm. Tickets are free, but donations are greatly appreciated. Click here to register! The revised NAFTA trade agreement makes some modest improvements, but it still lacks robust enforcement of labor and environmental protections for working people as well our clean air and water. Expanded patent rights for pharmaceutical corporations in the proposal will also make lifesaving medicines even less affordable. Congress must demand changes to the agreement or our race to the bottom will only get worse and worse. Members of the Maine AFL-CIO backed several bills this week that would bolster the safety net for workers who have been injured on the job. Firefighters delivered powerful testimonies in support of LD 600, sponsored by Sen. Shenna Bellows (D-Manchester), which would modernize outdated workers comp laws so that mental health injuries are treated the same as physical injuries. The measure would change the standard of proof required to demonstrate entitlement to compensation for a mental injury caused by stress so that it is the same standard as is required with respect to physical injuries. Workers’ comp laws were originally designed to strike a grand bargain between management and labor. As part of the deal, workers gave up the right to sue over work-related injuries, which was an enormous win for management. In exchange, labor was supposed to be provided with adequate wage replacement and medical coverage for workplace injuries. However, in the past few decades lawmakers have weakened workers’ comp laws to drive down insurance costs for employers. Working people who suffered no-fault injuries on the job once received annual cost-of-living increases for workers’ comp benefits, but the Legislature eliminated those COLAs in 1992. We are pushing to pass LD 601, sponsored by Sen. Shenna Bellows (D-Manchester), which would restore those COLAs. On Wednesday, Maine AFL-CIO testified on three more workers’ comp bills that would make the system more fair for injured workers, which you can read about here. The Labor and Housing Committee is expected to take up all of the bills and vote on one comprehensive workers’ comp reform legislation at a future date, so contact the committee members and tell them to support these important bills! The Labor and Housing Committee voted on party lines Wednesday to provide the right to paid sick leave for the nearly 200,000 Mainers who don’t currently have the benefit. LD 369, sponsored by Sen. Rebecca Millett (D-Cape Elizabeth), would guarantee the right to earned paid sick leave for employees working for companies with more than five workers and a right to unpaid sick leave for employers with fewer than five workers. The measure would ensure 90 percent of Maine workers have access to paid sick days while still exempting 60 percent of businesses from the mandate. If it passes, Maine would join ten states that have already instituted earned paid sick time. The bill faces further votes in the House and Senate so contact your legislators and ask them to support LD 369! Public Sector Right to Strike Bill Coming Soon! From West Virginia and Kentucky to Denver, Los Angeles and Oakland, teachers across the nation are striking or holding “sick-outs” to improve schools and address long-neglected needs of our children. Through direct action, teachers have secured important victories, including increased school funding, healthier learning environments for students and pay increases for woefully underpaid school staff. Whether it’s teachers, bus drivers or janitors, it takes collective action for workers to advocate effectively for each other and the important services they provide. Yet in Maine, the laws are tilted against public sector workers. In the public sector, if the parties can’t reach a contract, there is a process that involves mediation, fact-finding and then arbitration. But under Maine law, arbitration is binding on all issues except for economic issues like salary, insurances and retirement. So, even after an arbitration, public employers can simply impose their original offer on workers. Public employees also do not have the right to strike, leaving them without a critical tool to strengthen public services Mainers count on — services that for years have been understaffed and underfunded. In the coming weeks, we will be advocating very hard for two bills that would right this wrong. LD 900, sponsored by Rep. Mike Sylvester (D-Portland), would allow public employees to strike while another bill would grant public employees the right to go to binding arbitration over salaries, pensions, and insurance. So stay tuned because you’ll be hearing a lot more about them! For more state legislative news, including updates about bills to repeal tax cuts for the 1% and reduce misclassification of workers, visit our website! Reminder: It is important that all members call the hall when they get laid off from a job. This is especially important for travelers because it will notify staff to stop your travel dues. Upon notification, all laid off members will be moved to the Journeymen list and become available for the next job that comes up. NEW Apprenticeship Video from the United Association! 716 Members Get Out and Vote! Vote! Vote! 207-621-0555 or the Maine AFL-CIO at 207 622-9675. AFL-CIO at 207-622-9675.